Did you know that Special Olympics Nebraska is part of a global movement that serves more than 4 million athletes worldwide? The Special Olympics Strategic Plan helps provide direction on how to be better at impacting the lives of those with intellectual disabilities, both in the United States and abroad, and Nebraska is part of that larger focus. Last month, several members of the Special Olympics Nebraska staff attended the 2013 Special Olympics North America Conference in Charlotte, North Carolina. The conference was attended by athletes, staff and volunteer leadership from all over the United States, Canada, as well as the Caribbean! Each program came together to share ideas and learn the latest about the Special Olympics movement and strategic plan. 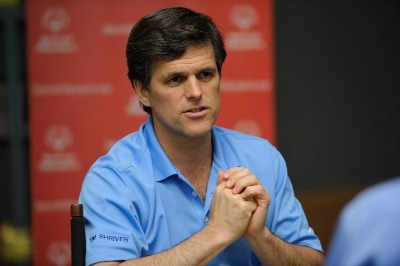 The interactive conference sessions were all based off of the five pillars of the Special Olympics global strategic plan: Advance Sports and Competition, Connect Fans and Funds, Build Communities, Develop Movement Leadership, and Establish Sustainable Capabilities. Attendees of the conference were also able to have a little fun during week at a reception at the NASCAR Hall of Fame and a trip to the US National Whitewater Olympic Training Center! As many of you know, Special Olympics is the world’s largest health organization for people with intellectual disabilities. This conference focused on the fact that obesity is a growing problem in our country and Special Olympics has the ability to help! Special Olympics International is partnering with Nike to kick-start programs, educate the public and help make obesity a thing of the past with our athletes, volunteers and staff! Representatives from Nike explained that the only way to combat this sedentary lifestyle that many Americans have adopted is TO MOVE! They encouraged Special Olympics to promote movement, play and sport in their Young Athlete Programs because, after all, these healthy habits are developed early on in life. Together, Nike and Special Olympics programs around the country, including Nebraska, hope to make our nation a healthier one! Sessions that were centered on the first pillar: Advance Sports and Competition drove home the point that our athletes are the focus of our work. Topics included working with the Department of Education guidelines to encourage Special Olympics Unified Sports to be a part of every school, creating partnerships that will strengthen our events and striving to have Special Olympics be recognized as a worldwide leader in sports. Connecting Fans and Funds included sessions that educated fundraising and non-fundraising staff and volunteers how to effectively help in the effort to make Special Olympics a sustainable, innovative organization. Topics covered under this pillar included how to communicate our mission effectively through story-telling and the value of the Special Olympics brand. The third pillar, Build Communities, focused on developing athlete leadership programs. We heard from several programs about their training and support for preparing athletes for leadership roles. This pillar also emphasized an exciting initiative called Healthy Communities to help increase access to quality healthcare for our athletes. These sessions also covered the impact of our youth leadership through Project UNIFY to promote inclusivity. There was also a focus on the Athlete Leadership Program (ALPs). Special Olympics Nebraska participates in this program which promotes athletes as leaders. We learned how to make his program better and expand it to reach many more of our Nebraskan athletes! Develop Movement Leadership is a pillar that encourages each program to find their strengths and leverage those strengths to work together and achieve greater success. Sessions under this pillar stressed the importance of staff, volunteers, school administrators and youth working together to reach a common goal. The Establish Sustainable Capabilities pillar concentrates on how Special Olympics can create the best processes and infrastructure to expand its global movement. Sessions with this theme in mind included learning about the role Special Olympics plays in the military, Special Olympics North America’s partnership with Special Olympics Caribbean and basic sessions on best practices that help Special Olympics Nebraska and other programs run smoothly! This conference really highlighted the many great things our organization is doing around the globe and we continue to support that movement here in Nebraska. The conference concluded with sessions regarding the 2014 National Games in New Jersey and the 2015 World Games in Los Angeles, California. We are excited to announce that qualifying athletes and coaches from our great state of Nebraska will be attending both of these games! Good luck to all our athletes!